Waking up on New Year’s Day to see an album released from Jeff Rosenstock, who put out one of my favourite albums of 2016, was a great way to start the new year. With no announcement beforehand, this was a surprise to all of his fans. The Long Island punk rockers new album ventures into some different territories while still being true to his hard-hitting style and lyricism. POST- is a solid album all the way through that will be on repeat for much of 2018. Compared to the previous album that was riddled with very short 1-minute songs, POST- goes in the opposite direction consisting of 9 tracks (excluding the opening song that is 5 seconds) with a very long opener and closer. The timing of this release was likely intentional and opening with a song called “USA” expresses the aggravations many feel towards the United States in the previous year. On this album, Jeff Rosenstock dives into introspective lyrics while also, as the title of “USA” suggests, refers to social issues and the current state of America. A very clear example of this is the song “TV Stars”, with the lyrics, “TV stars don’t care about who you are.” This is pretty clear shot at Donald Trump and the issues facing many Americans. Trump and American politics aside, what makes this album stand out to me is the noisy and chaotic style that is still polished and very enjoyable to listen to. These aspects are what made his previous album Worry so great and I’m glad to see this continue here. 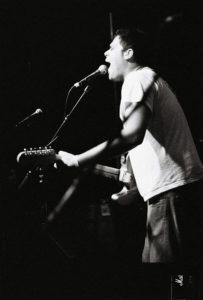 The song “USA” feels like a journey of the many styles Jeff Rosenstock includes in his music. It goes from the punk instrumentals, including very aggressive vocals, to slowing down with pop-punk elements and having peaceful interlude before the climax of the song. On the other hand, “9/10” is one of the more unique and different songs on the album that slows everything down with simplistic drums and a catchy synth. This song is a nice change of pace, which isn’t an unusual choice for Jeff Rosenstock, leading into the epic 11-minute closing song titled “Let Them Win”. This final track plays out like an anthem reminding you to not settle for the state of the world we are in. While lyrics are a very important aspect in music, it is the actual music itself that he creates that draws me in. When an artist can be screaming at the top of his lungs and it is still catchy and fun to sing along to, it doesn’t always matter if you agree with the subject of the songs. This is what makes him one of my favourite current artists and so enjoyable to listen to. Interestingly enough, some of my favourite songs on the previous album Worry were the quick 1 or 2 minute loud punk songs, but on this album, these longer pieces really stand out as some of his best work. While I still prefer Worry and would recommend people to listen to that alum first, POST- is a welcome addition to his discography and truly did not disappoint.